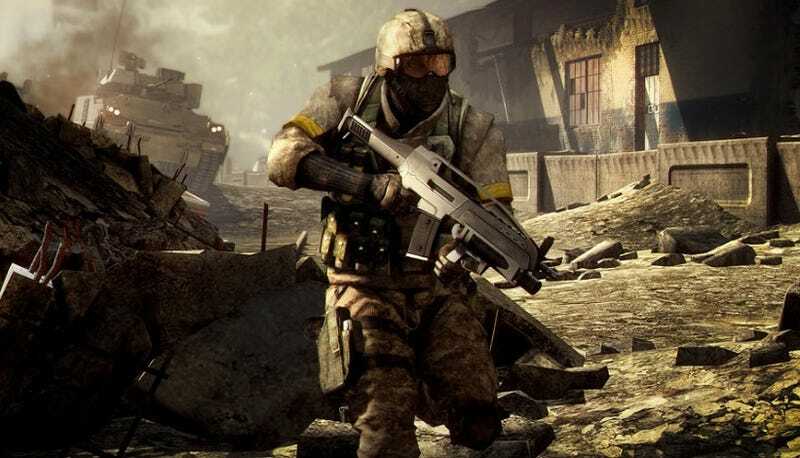 We already knew that EA believes March's Battlefield Bad Company 2 poses a threat to Activision's Modern Warfare series. In terms of multiplayer, they've made the case. For single player, they're finally getting specific. Developers from EA's DICE studio, longtime makers of the Battlefield series, told Geoff Keighley on the seasons premiere of Game Trailers TV that the campaign will last 10 hours, reuniting the lead characters from the first game, but putting them in a more serious situation. The game's producer Patrick Bach promised a similar scale of action as what's been shown for the game's multiplayer. Points of emphasis continues to be that players can use the vehicles they see in the game and blow up any building. The game's executive producer, Karl Magnus Troedsson, referred to the division of labor on the single-player and multiplayer portions of Battlefield Bad Company 2 as "a 50/50 effort." In December, EA CEO John Riccitiello told Kotaku that Bad Company 2 is part of EA's effort to reclaim some war-game glory: "I'm not saying it's going to happen tomorrow, but in the way that Activision sort of alternates sequels of Modern Warfare and Call of Duty and owns the leadership position in FPS [first-person-shooter], between [EA's] Medal of Honor and Battlefield, I want it back." Check out the full episode of GT TV to see if Modern Warfare owners ought to be envious.